Cunning label that says Allowrie Mixed Blossom Pure & Natural Honey. Also on the label in fine print reads Packed in Australia from quality imported and local ingredients. We may source quality assured international honey until Australian honey is available again. My tub of runny honey and crystallised lower 2/3 of the container smells awful, nothing like the local honey sourced from a local beekeeper, Gilbert’s Honey, South Australia. Be very wary. I was unsure when I first purchased this honey yet after having it on toast a couple of times it is an acquired taste. Now I wouldn’t buy any other brand. The thickness is missing in this Honey and it is sweeter than honey we normally like. The squeeze bottle is easy to use and clean but not a fan of mixed blossoms. The thickness is missing in this Honey and it is sweeter than honeybee normally like. The squeeze bottle is easy to use and clean but not a fan of mixed blossoms. My kids love their honey, and this product is easy and simple to use. However the kids aren’t so keen on the overall flavour of this product. Beautiful product. The container makes it easy to use and it comes from a trusted brand. The taste is lovely and it is beautiful on toast or fresh bread. 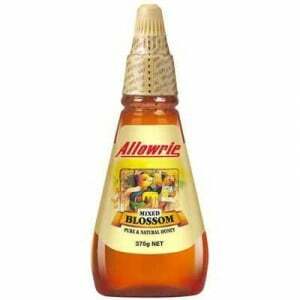 How would you rate Allowrie Mixed Blossom Twist & Squeeze Honey?